Seth as Wolverine and Chris as Nightcrawler play through the 1992 classic, X-Men Arcade game from Konami with hilarious results. Welcome to die! 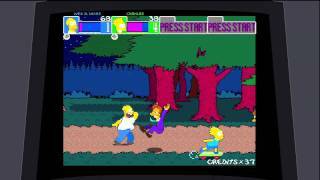 The Simpsons classic 1991 Konami Arcade Game Overview, Gameplay Video! This is Konami's classic "The Simpsons" Arcade Game. We refurbished this game in our classic video game store, and this is a quick overview of what the cabinet looks like and how it's set up. Also shows lots of gameplay on an official cabinet, check it out! You can see all the current arcade games we have at the moment at www.LyonsArcade.com !Joes Classic Video Games is owned and operated by Joe Lyons, our arcade division is known as Lyons Arcade, and our website is at LyonsArcade.com ... stop by to see it sometime! Our showroom and video game store is located at 139 Caldwell St, in beautiful Downtown Rock Hill, SC 29730. We have a huge 100 year old building full of arcade games for sale, classic games, pinball machines, and all kinds of coin operated and home video game accessories for your mancave or game room. We get items from the old penny arcade days all the way through the vintage arcade machines of the 70's, the best arcade games from the 90's, and on up to the modern day classics from the 90's ! Typically the best arcade games sell quickly, so although some of the videos you see here on our website may be of top titles they may have sold almost immediately after the video was finished. We get these old gmaes in typically in pretty rough shape, repair them, then film a video after we're done and upload it here fo rour friends on Youtube. People often wonder if we get free arcade games, not usually, we pay a decent prive even for ones that are broken or need repair. Typically we get 1 or 2 pinball machines in a month, and many more arcade games each month. If you enjoy videos like this, PLEASE subscribe to us above by clicking the button! It will notify you every time we put up a new video, which is usually once or twice a week. You can also stop by our website at www.LyonsArcade.com to see what we have in currently. Who knows, maybe we have something you're interested in!Thank you for watching! Japanese version is more speed run friendlyStage 1: Not too bad could be betterStage 2: Not too bad wish I didnt get hit by Krusty Balloon though.Stage 3: Could've gone betterStage 4: Screwed up the timing on the boss multiple timesStage 5: Died stupidlyStage 6: Boss went fine everything else was mehStage 7: Could've gone better, stupid Ninjas.Stage 8: Smithers could've been done better and Burns definitely could've gone better. Chris and Seth explore the wild, untamed wilderness while fighting creepers and befriending chickens in Minecraft for the Xbox 360. Spidy's back along with the Green Goblin and Scorpion this time as they rescue Crash Bandicoot's island from more holographic aliens in Spider-Man: Friend or Foe for the Xbox 360. By request, Seth and Chris attempt to make their way through the 1991 classic Battletoads for the Nintendo Entertainment System... at least as far as they can before giving up.